I love writing an In My Kitchen post, I love sharing a few going’s on from my kitchen, and as recently usual, I’m sharing it in video form (which you can watch at the end of of post). Last year I bought an old stove top Fowlers Vacola from one of those Facebook Buy, Swap, Sell pages. It was $50, and came with a bunch of accessories. I was so excited to buy it, then promptly put it into the shed and forgot about it. Well, I’l tell you that this won’t happen any longer, Fowlers Vacola’s unite! I’m getting my can on! Probably my favourite thing about this time of year is the fresh figs. I usually wonder the streets of Portarlington and keep my eye on the few curb side fig trees and as they ripen I pick a couple here and there. These ones, however were given to Mum and I as we left the Geelong Sustainability meet-up last week and were lush! That’s right, I am now the proud and very excited owner of a Kitchenmaid. I love the machine, but I find the price to be completely outrageous but I was very lucky to be given a bit of money to help with the purchase of it from my Mama (check out the video for the full story). I love it and I am already on the look out for which attachments I need, I’m thinking the pasta machine. I borrowed this book from the library, and within 15 minutes I had a dough on the go. Granted, it didn’t turn out so well, so I gave it a go the next night and perfection! I’ve cooked the Nan-e Barbari since and can’t wait to dive in even deeper. This book, not just due to it’s wonderful philosophy of empowering low-income, minorities (mostly women) but also because of it’s super simple instructions, beautiful recipes and gorgeous pictures. 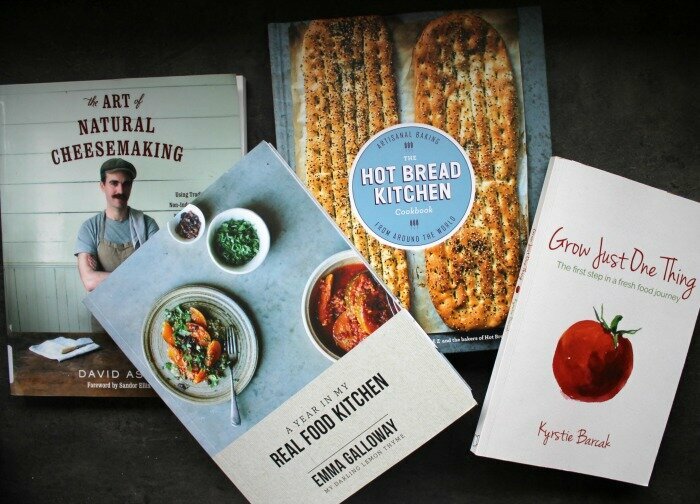 I was so lucky to win this cookbook via Emma Galloway of My Darling Lemon Thyme’s Instagram. This cookbook contains mouth watering gluten free, vegetarian and seasonal recipes. We recently cooked the baked jalepno to share at a dinner party and it was a huge win, even for those who don’t like spice. I initially saw this book recommended on Milkwood Permaculture’s site, and was intrigued. I’d done a cheese making course with Corinne from Drysdale Goats cheese, but was yet to try the lessons I’ve learnt at home. I’m looking forward to giving it a go. A beautifully simple book about gardening. Krystie’s, from A Fresh Legacy, philosophy is that every can have a vegetable garden, all it takes is to start to Grow Just One Thing. I haven’t read the whole thing, but so far the instructions are clear, the information necessary to begin is there and she with every book she gives a small packet of organic seed to help you on your journey. Thank you so much for taking a peep into my kitchen this month, don’t forget to pop over to Orgasmic Chef to have a look into other kitchens all around the world, and have a watch of the video below. Thanks for including me in your kitchen Clare. I hope you enjoy the other sections of the book when you get to read it. You have a lovely collection there. Thanks so much, I’m in love with my kitchenaid!